KIEV, April 10. /TASS/. Ukraine’s front-running presidential contender and showman Vladimir Zelensky has released a new video message in response to more than 2,000 billboards featuring incumbent President Pyotr Poroshenko face-to-face with Russian leader Vladimir Putin. 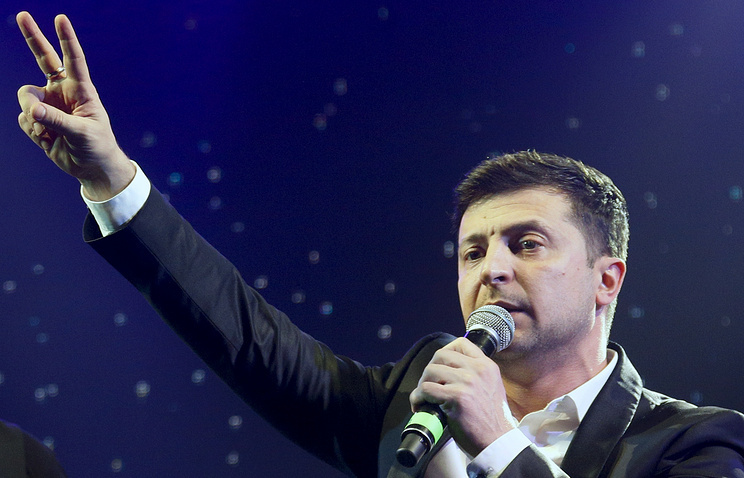 In his appeal to Poroshenko, Zelensky stated "On April 21 there will be only one choice - either the past or the future," stressing that the Kiev authorities have divided Ukrainians into "right and wrong" ones. "We are tired of waiting until this era of greed, poverty and lie ends. That’s why we united to move forward," he stated. President Poroshenko has built his election campaign around matching up himself against the Russian president. He said the Russian leader was his main opponent at the election, and those who were against him therefore support Putin. Under Ukraine’s law, advertisements cannot feature images of people without their written consent. It is also outlawed to show people who are not Ukrainian citizens for election campaigning purposes. The leader of the Civil Position Party, Anatoly Gritsenko, was among the first who criticized Poroshenko’s election advertising campaign saying it was aimed at splitting the country. In the first round of Ukraine’s presidential race on March 31, the candidate from the Servant of the People party Vladimir Zelensky received 30.24% of the vote, while Poroshenko, who seeks a second term, came in second with 15.95%.